Our foreign independent film selection for this week is City of God. 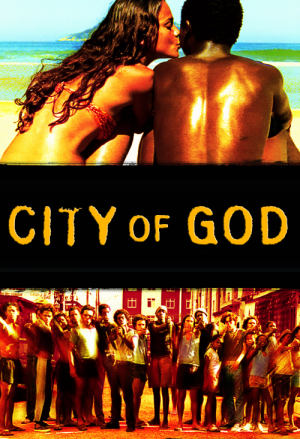 City of God depicts the gang life in Rio De Janeiro. Centered on the journey of Rocket, it shows just how helpless one could get once the damnation decides to hound you. It felt rough and gritty. That’s how I would describe the film. It felt like whenever someone is getting shot, blood would actually burst out of the screen. Whenever someone is getting stabbed, I keep on waiting for blood splatter across my wall. That’s how real it felt for me and that’s how bloody it was. It may be a function of the characters too. Everyone in the movie was rough and tough and angry and loud. Unlike other films, the director doesn’t offer a higher reason or higher purpose that motivates the evil of each character. There are no sick mothers or disturbed childhood or some angst they couldn’t get rid. The characters played for no other purpose but their own survival or ambition to conquer the city. As a result, I didn’t really find myself cheering for anyone. It was as if the director intentionally detached the characters from the audience to allow the audience to understand the whole story objectively. It seems that the director’s purpose is for the audience to feel reality, not necessarily love the characters enough to want to save them. I was more like a spectator. I was in on the action and I enjoyed the violence but it also allowed me to take a step back and actually understand what the film is trying to say. I didn’t have a lot of emotions at stake which made me become more fair in “judging” the situation. I don’t know any of the actors but whoever they were, they were perfect for the role. They were able to bring the simplicity and roughness that their characters needed to make the movie believable. Sure, there were some kinks here and there, there were some eyes that needed to act more and some little nuisance that should have been brought in but generally, it was good. There’s a reason Time Magazine included this in the list of Greatest Foreign Film of all time. It’s worth the watch. In fact, it is necessary that you watch. After all, the gang life in LA is no different from the gang life Rio. LA gang life has one advantage, sophistication in weaponry. We will have more independent film selection in the future. Hope you come back. Must Watch Malaysian Film: Sell Out!